It has been one year since the last edition of the Harvard National Model United Nations (HNMUN), which took place at the Boston Park Plaza and is plenty of time for the renewed staff to come up with incredible ideas to fulfill the delegates’ expectations on the 61st edition of the model. 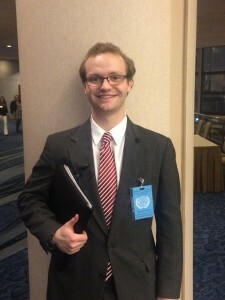 His name is Bennett Vogt and he is going to be the Under-Secretary-General for Administration until February 15. One of the tasks he had to fulfill before the conference was to recruit the delegates and guide them through the application process. May sound easy but keep in mind there has been around 2 500 delegates per model.In addition, he is in charge of the organizational and logistical capacities. We wondered why the conference is being held on the Marriot Copley Place and not the Boston Park Plaza (BPP), as previous editions and he tells us that the primary reason of the change of the hotel is the BPP renovations, which are currently taking place. Not because of Wi-Fi issue as many of us believed. It was actually because of the heavy storm last year, one of the worst on the last 20 years. “Last HNMUN I was Director of Administration and every year it is given the opportunity to the staff to escalate position by agreeing on having more responsibilities”. One may ask why would anyone agreed on having more responsibilities when you can invest your time on doing something more productive. However, most of us who participate in the conference firmly believe there is still time to make an impact on the world. To prove that the youth is NOT the future of the country. On the contrary, we are the present. The HNMUN staff, comprised by Harvard students, shows more and more commitment towards us by sacrificing hours of study in order to guide us in the making of potential ideas, which can change the world. “Why did I say yes?” I asked Benet. After contemplating the question for few seconds, he remembers last year’s closing ceremony and a very emotional moment: Venezuelan flags waving all across the room. Let’s remember last year’s inner conflict in Venezuela where the situation almost turned into a riot when the army did not let students protest for what they believed was right. “As Jeff said in the opening ceremony: “This may not be a large event in an international scale but it is important and valuable what we do and what we provide””. That is what he likes the most. His preparation involved many spreadsheets and organizational skills. Primarily just working to organize the staff during weekly office hours to prepare the conference. He has put a lot of effort into his charge. It is still day 2 of the conference and not much has happened but we are sure the staff has plenty of surprises for us to be amazed. We asked Bennet if there were any surprises at all, to which he replied: “Well, if there were any I wouldn’t be able to reveal them or else they wouldn’t be surprises”.